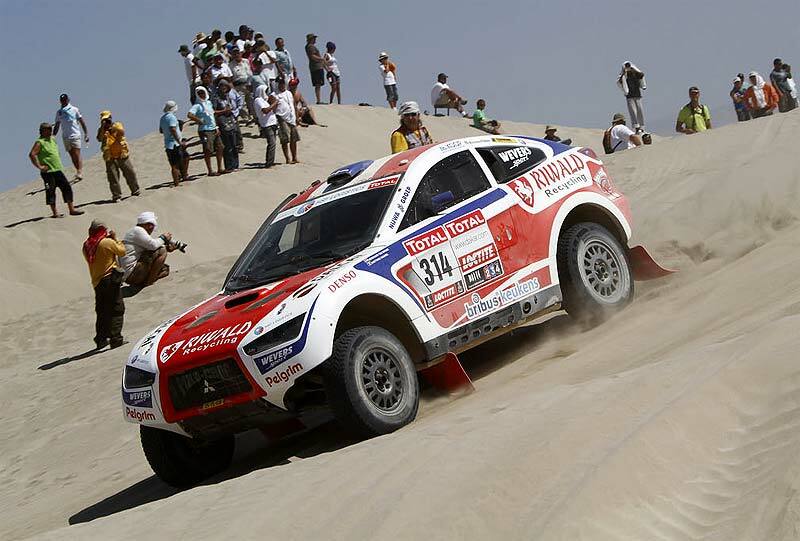 SA-Dakar Rally: Ten Brinke/Baumel best Mitsubishi crew in 2012 and Top 10. 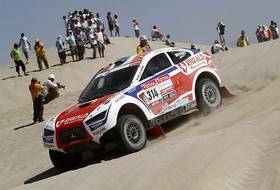 The last big stage on the way to Lima - and the Dutch Bernhard ten Brinke and his French codriver Matthieu Baumel had a heavy setback to endure: The drive shaft of their former factory Mitsubishi Racing Lancer (rebuilt by Wevers Sport) was broken and they lost 40 minutes. 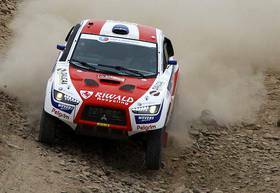 So they had to speed up to hold their position as best Mitsubishi in the overall Top 10 - and they did: From WP1 to finish they were 1 minute faster than Peterhansel. Nice, but in general, they dropped two places, from the 7th to 9th place, but are still in the Top 10 - as the only Mitsubishi. 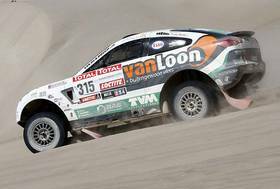 Once again Matthieu Baumel has proven to be a gigantic important factor for the Team, because today the Frenchman navigated Ten Brinke along the dune where everyone got stuck. They have ridden gigantic fast and so have limited the damage in minutes. The second "Wevers-Mitsubishi" with teamchef Erik Wevers and Fabian Lurquin got stuck for a long time. "Erik signed to me: continue" reported Berhard ten Brinke. "I don’t know how long they have got stuck there." But they could continue the route along with its sequels and they came as 42nd on the finish, which means 34th overall. 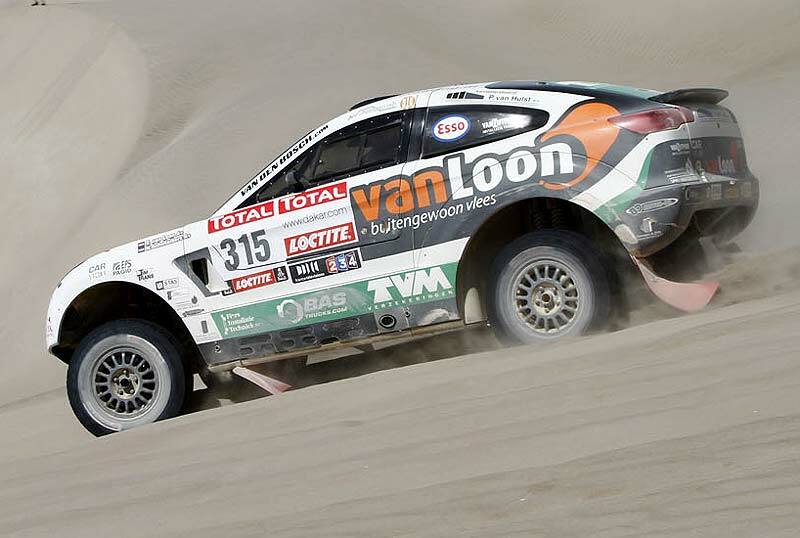 In the overall rankings, the Wevers-Mitsubishi of Ten Brinke/Baumel is now the only in the Top 10 (9th, +05:11:41), followed by Erik van Loon / Harmen Scholtalbers in their Racing Lancer (17th, +15:04:46), the L200 Triton-pickup of the Russians Melnikov/Nikolaev (18th, +15:28:00) and the Chinese crew Zhou / Pan (L200 Triton, 32th, +22:50:31) and Erik Wevers (34th, +23:59:08).